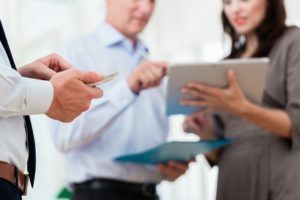 Your franchise business faces unique challenges when it comes to creating and distributing marketing materials. As a franchise marketer, you need solutions that build a strong brand to recruit and retain customers. You also need to support your franchisees, who have their own set of requirements. They need to effectively market to their targeted local audience with location-specific print advertising, digital and direct mail campaigns, and point-of-sale displays. How does it all get done with consistent messaging throughout your entire organization? Believe it or not, it’s simple. You need professional franchise marketing solutions. Here’s what to look for. At the forefront of any franchise marketing system is brand compliance. Your organization needs to maintain brand consistency with its image regardless of how many locations you have. Look for brand management software that allows you to control your marketing templates, logos, and digital assets. That way, the needed creative for any authorized stakeholder is always a few quick keystrokes away. You should also have built-in brand guidelines and approvals so you can be sure your marketing materials are always compliant. Here’s an example. Let’s say you have a business with locations across the United States. Naturally, you want to be consistent with the same branding from one location to the next. That way, customers can recognize your brand anywhere because the primary marketing elements are consistent. At the same time, however, you recognize that each location has to meet certain local needs. Your franchise marketing solution should provide all the materials necessary to accomplish this. The result? Store logos and signage are compliant. Plus, seasonal promotions and offers are consistent—all while giving each location the freedom to appeal to their local audience. When local marketers have the brand-approved assets they need, they’re empowered to take control of their own franchise marketing solutions. There’s no reason for them to request marketing materials each time they have to work on a new campaign or promotion. This freedom allows them to promote special events with location-specific details or to announce special offers quickly and easily. 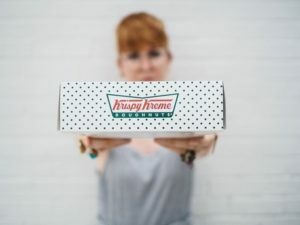 Take the case of a franchise like the Krispy Kreme Doughnut Corporation. They have over 1,400 retail shops in 34 countries while maintaining a headquarters in Charlotte, NC. When they’re promoting their Cinnamon Swirl Doughnut or Pumpkin Spice Cake flavors during the fall months, they want the promotional signage at each store to be the same. There are times, however, when the need to localize occurs in regards to prices, language, and other variations. Maybe a local sports team is on the throes of a championship season. The local Krispy Kreme restaurant announces a special celebratory offering by selling a doughnut decorated in the team’s official colors. It only makes sense to provide this at one location, as it caters to a local audience that’s anxious to celebrate their local sports heroes at any given opportunity. As a result, the local slant draws in more customers. Franchise marketers need their marketing materials to be consistent across all channels. For instance, point-of-sale displays and direct mail both need to work alongside email and social media campaigns. Your marketing efforts should influence your consumers at every touchpoint—meaning everywhere they interact with your brand. Your franchise marketing system must be multichannel, engineered to order, and scalable to meet your marketing goals. Let’s go back to the Krispy Kreme example. It’s important for customers to see the same images and verbiage, from digital ads to store signage. Anything less could cause confusion and eventually lead to distrust. A consumer wouldn’t expect to see an October ad for Pumpkin Spice Cake doughnuts online or via a direct mail piece, then visit a Krispy Kreme location to find no prominent mention of it. Consider the popular Starbucks holiday beverages. The franchise’s Caramel Brulée, Peppermint, and Toasted White Chocolate flavors should be served in festive, colorful cups—as seen in the TV, magazine, and online ads, as well as the Starbucks website and app. If a customer gets a regular, white Starbucks cup when they visit during this promotion, it’s likely to create a disappointing experience. The beverage might be the same, but it somehow tastes better in one of the advertised, decorated holiday cups. Be sure to look for franchise marketing solutions that include a digital asset management (DAM) system. You can shorten your production times when you aren’t sifting through emails or file folders searching for approved images to send to franchisees. This means they aren’t delayed waiting for the franchise marketing solutions they need. Plus, you’re not wasting your marketing dollars sending them displays that don’t work for their stores. Each location has the ability to edit their own point-of-sale materials to reflect their individual prices, language, and local variations. Thus, it’s quick, easy, and doesn’t require any graphic design software experience to make it happen. You provide the marketing materials for franchisees to pick from, like approved brand images, logos, or audio and video files. The files are available for use in pre-designed, customizable templates, which allows them to localize certain aspects to suit their needs. As an added layer of brand compliance protection, be sure to choose a franchise marketing solution with provided guidelines and mandatory approvals. That way, you can ensure your marketing materials are always brand compliant. How much time do you waste rummaging through old emails and seemingly endless file folders, trying to find that approved image for your latest marketing campaign? If you want faster production times (who doesn’t? ), look for a franchise marketing solution where you can streamline this process to a few clicks. What used to take days to complete should only take a few minutes. On a similar note, franchises typically spend far too much time catering to the marketing needs of their franchisees. 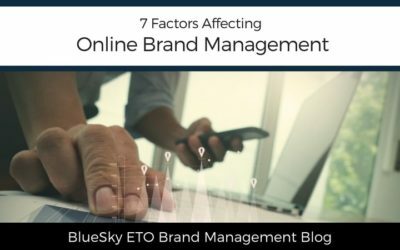 A franchise marketing solution like BlueSky ETO’s custom-designed software enables you to speed up the production process. Your designers won’t need to deal with endless requests and slow workflows. Rather than allowing local marketers to contact you for their individual marketing needs, you can create a cloud-based, web-accessible headquarters for all your brand-approved marketing materials. For example, when a Krispy Kreme franchisee needs a point-of-sale display or any other type of marketing asset, the solution is within reach 24/7. They don’t have to involve their national marketing manager or the marketing department’s design team. This speeds up the entire production process while giving designers the freedom to concentrate on other important projects. Look for a franchise marketing solution where you can reduce waste. Did you know your marketing materials might get thrown out if they don’t fit the dimensions of a franchisee’s local space? That’s because not all stores are the same. You can keep your marketing materials out of the trash bin by allowing your local franchisees to select the marketing materials that fit their particular requirements. You provide only what’s needed—when and where it’s needed. Digital print-on-demand solutions are a smart way to produce your marketing collateral because they create less waste. And less waste means money saved. Take DoubleTree by Hilton as an example. The American hotel chain utilized on-demand printing to avoid large minimum order quantities for their properties’ marketing needs. As a result, it’s now easy (and cost-effective) for each one to create attractive collateral for seasonal promotions or special events. There’s also another way to reduce waste. With the proper franchise marketing solutions in place, you’ll streamline your production process, reduce or eliminate errors, and prevent wasted time. As your profits increase and your products and services expand, your data also grows. These are, of course, good things, but they also have the potential to pose problems—if you’re not prepared. Look for franchise marketing solutions that adapt as your business develops. It should be easy to add new locations and users to your franchiser marketing system. Additionally, it should be just as simple to increase your storage or production capabilities or to create multi-tier permission levels for different users. No matter how much your business grows, you need a franchise marketing solution that grows along with you. Also, consider scalability in the case of automation. You can build a marketing campaign around triggered events. As your number of contacts grows, you can automate any ongoing communication via print, email, text messages, or social media channels. That way, as your follower counts grow, the amount of work you have to do doesn’t. Look for franchise marketing solutions that feature APIs (Application Programming Interfaces). APIs allow for data communication across different software systems. It’s important to avoid duplicate contacts, conflicted formatting, or even a single bit of broken code—all of which can corrupt your sales and marketing strategy in an instant. The best infrastructure is one that’s built for clean data input, ready to deliver clear, measurable results. Your franchise marketing solutions should also integrate with your current print vendors and methods of production. If you don’t have a preferred print vendor to process your data, consider MSP. With more than 65 years of experience, MSP can help you achieve your marketing goals with direct mail production, automated direct mail and web-to-print marketing, personalized mail, and top-notch customer service support. 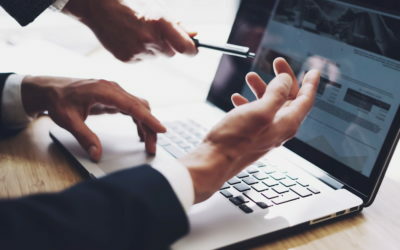 A central feature to look for with your franchise marketing solutions is comprehensive reporting that’s simple to create, customize, and analyze. Your data’s telling a story if you’re listening. Develop and share reports on a wide variety of valuable marketing insights—from direct mail distribution and production status to user engagement, e-commerce sales details, digital asset searches, and much more. These reports should be easy to access while providing a detailed way for you to learn about and analyze your marketing efforts. Track your product sales in a variety of ways—by the product’s name, the quantity sold, or the sales total—on a daily or monthly basis. Find your most popular categories in an instant. Receive a notification about abandoned products in shopping carts (that way you can create an automated message that gently reminds the customer to make the purchase). Find out when your inventory is low. Identify your top customers so you can create special offers just for their needs. Track coupon and promo code redemptions. 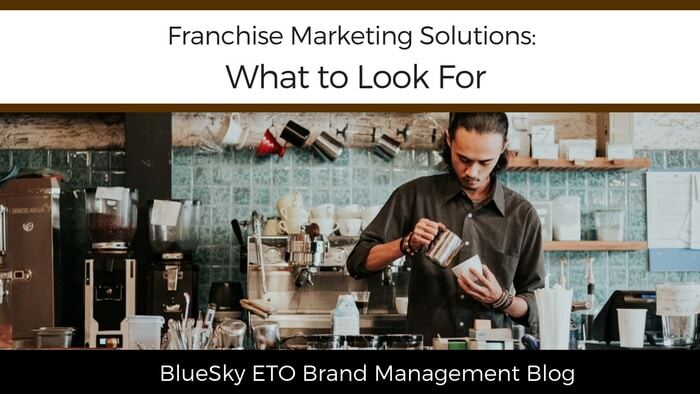 For a full list of reporting features you can expect from your franchise marketing solutions, check out BlueSky ETO’s robust reporting software. So, what’s the end result from all these franchise marketing solutions? They wouldn’t be much good without an improved return on your investment. It’s one of the big benefits of investing in brand management software. 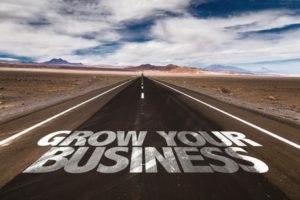 Franchise marketing solutions don’t provide a specific financial guarantee, but they do put you in a great position to be successful with your marketing efforts. As a franchisor, your focus is on the brand compliance among your franchisees and localizing your brand communications. That allows you to empower your marketers “in the field” to develop your marketing collateral for their individual needs. A global marketing strategy is oftentimes not the best way to approach a local audience. They require local marketing, which leads to increased response rates—and increased sales. No matter what marketing role or industry you’re involved in, franchise marketing solutions can be the difference maker for your marketing strategy. You’ll achieve brand consistency by increasing productivity and empowering your local marketers. 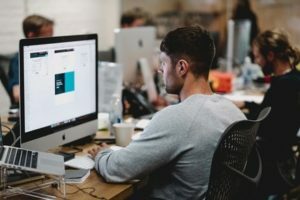 You’ll also notice faster production, improved scalability, reduced marketing waste, easy integration across different software systems, and ultimately an improved marketing ROI. Don’t settle for franchise marketing solutions that don’t meet your needs. 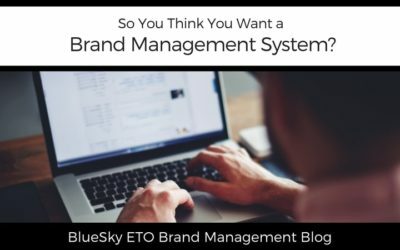 Every BlueSky ETO solution is engineered to order for your organization. Schedule a free consultation to learn how franchise marketing solutions can help your marketing efforts today. So much goes into a franchise business! I must say, a must-read guide for every marketing expert. I am glad to inform you that I have decided to take into your advice and implement it soon. Franchise Marketing is a very crucial step to expand your business. I really like how you summed up everything that one should know to accomplish it. Definitely true – reducing waste by creating less waste. And less waste means money saved! Thanks for sharing such an informative blog! It goes without saying that you must first have a franchise marketing plan and strategy to sell franchises in order to succeed as a franchisor. Thanks for the write up. So much goes into a franchise business! Very informative and helpful article. Thank you for sharing your knowledge. Very informative. Thank your for sharing! This is some really great information. I learned a lot about Franchise Marketing from this post. Great information, I didn’t know most the stuff mentioned above but thanks for introducing it to me! This is an informative post. don’t much about Franchise marketing solutions. Thanks for sharing. Franchise marketing has always puzzle me on how it works, thanks for clearing it for everyone from point A-Z. Franchising and branding has always intrigued me. Thanks for explaining! Great information. This might come handy one day if I go franchisee route. Thanks! These are all really great tips. You’ve provided me with a quick education on something I knew nothing about. Thanks for sharing! Very informative and insightful. The part that I like the most is the reduced waste and giving control to the marketers. This is a super informative post. I honestly do not know much about franchise marketing but have learned a lot from your tips. Great advice. I am planning to start my own business / franchise one. Your articlw is very helpful. Thanks for the tips about Franchise marketing. I am not very familiar with this so this was a helpful read. Wow, you really opened my eyes. This is new to me. thanks for sharing! The importance of good franchise marketing. Good franchise marketing has never been more important nor had such a huge impact on the success of franchising. … The most effective way to achieve this is through franchise marketing, applied consistently to promote a business in every aspect of development. Fantastic advice about Franchise marketing solutions. Its an area I am not really knowledgeable but there are some handy tips here.